We don’t leave home often, but we have traveled a few places. I also really enjoy exploring my family history. 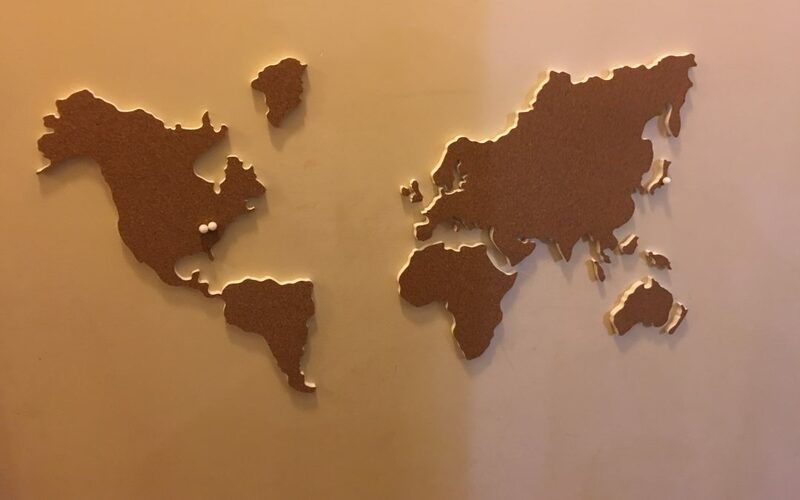 To tie everything to our life we decided to add maps to our house. We have a world map made of corkboard that we have marked with push pins for each place someone in our family currently is. Two years ago our family included an exchange student and as far as we are concerned she is also part of the family – so if you look closely you can see a tab by her family in Tokyo Japan also. We also have tabs side by side for our house and for my two older sons that are about 2.5 hours away from us. The tabs give us a little bit of an idea of how far away everything is compared to where we are. We’ve been to such a small part of the world that it’s really interesting to see how everything relates to where we are. 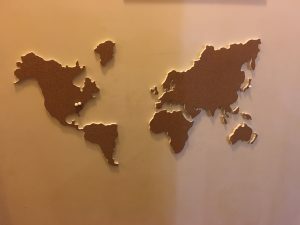 I would love to include it on a globe, but haven’t figured out how to put a globe on the wall! 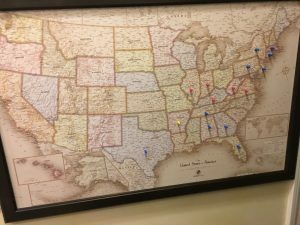 Our next framed m ap includes just the US and includes magnetic pins for what states we have visited. We have been using different colors to mark ones that my youngest remembers visiting as opposed to the states that we have visiting during the time before his ‘recorded memory’. It has made it interesting to add a state to the map and we’ve had a few stories to go with to go through the don’t you remember when we visited…..
My Aunt years ago would get a postcard from each location that she visited, but this is a prettier, much more visual way to see the states in a quick way. – Though I have to admit, I have started my own postcard collection. I do still have her collection, which includes cards from all of the 48 states (what was the whole US at the time she was traveling) I actually just looked it up to double check. After double checking I was surprised to learn that Hawaii wasn’t a state when my husband was born. There were actually one 48 states when my husband was born! We don’t currently have a map to show our family history map, but I’ve seen something similar on ancestry.com with their new gen communities. The map shows my mom’s gen community map. 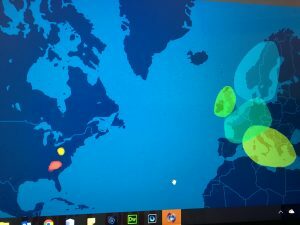 The right ties to her DNA results and what we had previously noticed and the left represents where her family had immigrated to. I’d love to get a world map like the US map we have and put some magnetic markers in spots that we know our direct ancestors lived. It’s amazing to see all the locations that our family has ties to from history. Linking the map with a timeline and key points in history would be ahistory lesson. Questions come up – Did my family leave Germany before WWI? Did they leave Italy before WWII? Did they leave Ireland before the Potato Famine? I already know some of my ancestors were here for the revolutionary war…. what states were they in? I do know the answers to these questions because I have researched family history, but it’s amazing the things you find when you can link everything to places, and even local events that were going on. For example, my grandmother’s brothers were in a cave in at a coal mine, they survived, but it was a pretty bad coal mine accident. Knowing about the area and the accident provides some information about our family that will become missing over time. 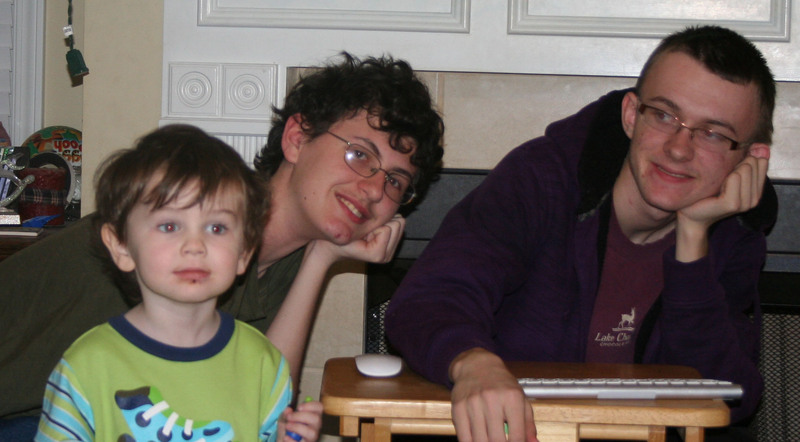 Do you have an interesting way to keep track of where your family has been?